Jack (right) and Ted Kennedy on the sailboat Victura, a gift to Jack from his parents. 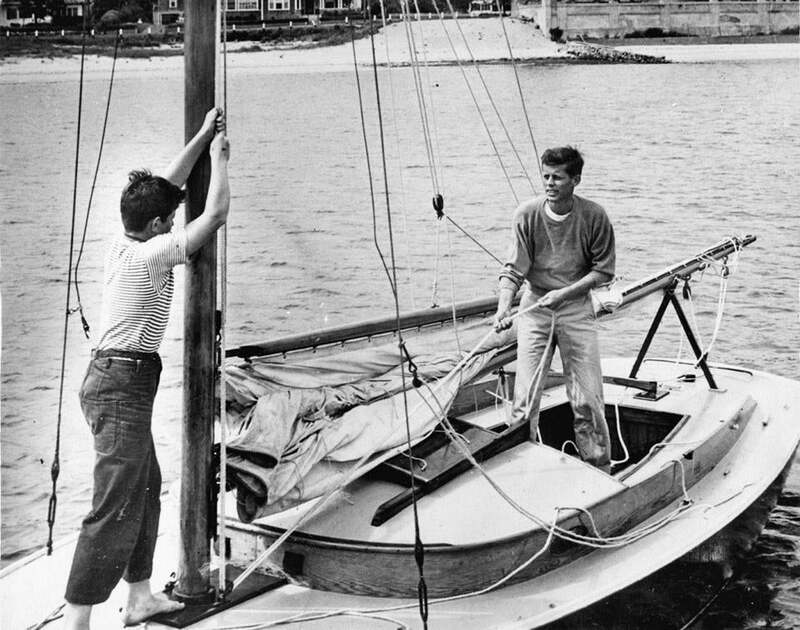 President John F. Kennedy’s beloved sailboat Victura, Latin for “about to conquer,” was a birthday gift from his parents when he turned 15. He soon started winning races, eventually becoming one of the best collegiate sailors in New England. It was on that approximately 25-foot Wianno Senior, built in 1932, that he taught his wife, Jackie, to sail, and the Life magazine photos of them at sea branded the young couple as vital and daring. When Kennedy was on shore, he doodled pictures of the sloop, and the Oval Office at the White House was a shrine to sailing. The biggest piece of seafaring memorabilia was Kennedy’s desk, made from the timbers of the HMS Resolute, abandoned by the crew after it got locked in ice in the Arctic. Every winter Victura is taken from its spot on the lawn of the John F. Kennedy Presidential Library and Museum in Dorchester to winter in the Crosby Yacht Yard in Osterville. The boat yard, founded in 1850, is still building boats like Kennedy’s, now out of fiberglass instead of wood. This year the return of Victura to the Kennedy Library will be celebrated at 1 p.m. May 18 with a talk by James W. Graham, author of “Victura: The Kennedys, a Sailboat, and the Sea” (ForeEdge). Bob Oakes, host of WBUR’s “Morning Edition,” will be the moderator. For the first time in the 26-year history of the annual Triangle Awards, the book named the best debut novel also has won the prize for best LGBT fiction. The double winner is Sara Farizan’s “If You Could Be Mine” (Algonquin), about a 17-year-old in love with another girl in Iran, where homosexuality is a crime. Farizan, the Massachusetts-born daughter of Iranian immigrants, was deeply closeted until college. The awards are sponsored by the Publishing Triangle, an association that fosters the publication of books written by LGBT authors and/or with LGBT themes. T. Coraghessan Boyle, for whom the state of the earth is a gnawing issue, is the 2014 winner of the Henry David Thoreau Prize for Literary Excellence in Nature Writing. The PEN New England prize, established in 2010, will be awarded to Boyle at 6:30 Wednesday evening at MIT’s List Visual Arts Center, 20 Ames St., Cambridge.